Story copyright © 1992, 2017 Aaron Shepard. Script copyright © 1993, 1996, 1997, 2002, 2017 Aaron Shepard. Scripts in this series are free and may be copied, shared, and performed for any noncommercial purpose, except they may not be posted online without permission. 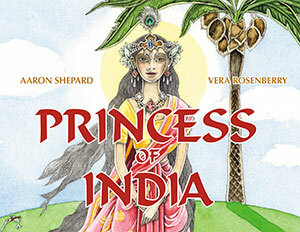 PREVIEW: The princess Savitri must use all her wit and will to save her husband from the god of death. All special features are at www.aaronshep.com/extras. NARRATOR: In India, in the time of legend, there lived a king with many wives but not one child. Morning and evening for eighteen years, he faced the fire on the sacred altar and prayed for the gift of children. Finally, a shining goddess rose from the flames. GODDESS: I am Savitri, child of the Sun. By your prayers, you have won a daughter. NARRATOR: Within a year, a daughter came to the king and his favorite wife. He named her Savitri, after the goddess. Beauty and intelligence were the princess Savitri’s, and eyes that shone like the sun. So splendid was she, people thought she herself was a goddess. Yet when the time came for her to marry, no man asked for her. KING: Weak men turn away from radiance like yours. Go out and find a man worthy of you. Then I will arrange the marriage. NARRATOR: In the company of servants and councilors, Savitri traveled from place to place. After many days, she came upon a hermitage by a river crossing. Here lived many who had left the towns and cities for a life of prayer and study. Savitri entered the hall of worship and bowed to the eldest teacher. As they spoke, a young man with shining eyes came into the hall. He guided another man, old and blind. SAVITRI: (softly, to TEACHER) Who is that young man? TEACHER: (smiling) That is Prince Satyavan. He guides his father, a king whose realm was conquered. It is well that Satyavan’s name means “Son of Truth,” for no man is richer in virtue. NARRATOR: When Savitri returned home, she found her father with the holy seer called Narada. KING: Daughter, have you found a man you wish to marry? SAVITRI: Yes, father. His name is Satyavan. NARADA: (gasps) Not Satyavan! Princess, no man could be more worthy, but you must not marry him! I know the future. Satyavan will die, one year from today! KING: Do you hear, daughter? Choose a different husband! SAVITRI: (shaken but resolute) I have chosen Satyavan, and I will not choose another. However long or short his life, I wish to share it. SATYAVAN: Can you bear the hard life of the hermitage? Will you wear our simple robe and our coat of matted bark? Will you eat only fruit and plants of the wild? SAVITRI: I care nothing about comfort or hardship. In palace or in hermitage, I am content. NARRATOR: That very day, Savitri and Satyavan walked hand in hand around the sacred fire in the hall of worship. In front of all the priests and hermits, they became husband and wife. NARRATOR: For a year, they lived happily. But Savitri could never forget that Satyavan’s death drew closer. Finally, only three days remained. Savitri entered the hall of worship and faced the sacred fire. There she prayed for three days and nights, not eating or sleeping. SATYAVAN: My love, prayer and fasting are good. But why be this hard on yourself? NARRATOR: Savitri gave no answer. The sun was just rising when Savitri at last left the hall. She saw Satyavan heading for the forest, an ax on his shoulder. Savitri rushed to his side. SAVITRI: I will come with you. SATYAVAN: Stay here, my love. You should eat and rest. SAVITRI: My heart is set on going. NARRATOR: Hand in hand, Savitri and Satyavan walked over wooded hills. They smelled the blossoms on flowering trees, and paused beside clear streams. The cries of peacocks echoed through the woods. While Savitri rested, Satyavan chopped firewood from a fallen tree. Suddenly, he dropped his ax. NARRATOR: Savitri rushed to him. She set him down in the shade of a tree. SATYAVAN: My body is burning! What is wrong with me? NARRATOR: Satyavan’s eyes closed. His breathing slowed. YAMA: (gently) Princess, you see me only by the power of your prayer and fasting. I am Yama, god of death. Now is the time I must take the spirit of Satyavan. NARRATOR: Yama took a small noose and passed it through Satyavan’s breast, as if through air. He drew out a tiny likeness of Satyavan, no bigger than a thumb. Satyavan’s breathing stopped. YAMA: Happiness awaits your husband in my kingdom. Satyavan is a man of great virtue. NARRATOR: Yama placed the likeness inside his robe. Then he turned and headed south, back to his domain. Savitri rose and started after him. Yama strode smoothly and swiftly through the woods, while Savitri struggled to keep up. Finally, Yama turned to her. YAMA: Savitri! You cannot follow to the land of the dead! SAVITRI: Lord Yama, I know your duty is to take my husband. But my duty as his wife is to stay beside him! YAMA: Princess, that duty is at an end! Still, I admire your loyalty. I will grant you a favor—anything but the life of your husband. SAVITRI: Please restore my father-in-law’s kingdom and his sight. YAMA: His sight and his kingdom shall be restored. NARRATOR: Yama again headed south. Savitri followed. Along a river bank, thorns and tall sharp grass let Yama pass untouched. But they tore at Savitri’s clothes and skin. YAMA: Savitri! You have come far enough! SAVITRI: Lord Yama, I know my husband will find happiness in your kingdom. But you carry away the happiness that is mine! YAMA: Princess, even love must bend to fate! Still, I admire your devotion. I will grant you another favor—anything but the life of your husband. SAVITRI: Grant many more children to my father. YAMA: Your father shall have many more children. NARRATOR: Yama once more turned south. Again, Savitri followed. Up a steep hill Yama glided, while Savitri clambered after. At the top, Yama halted. YAMA: Savitri! I forbid you to come farther! SAVITRI: Lord Yama, you are respected and revered by all. Yet no matter what may come, I will remain by Satyavan! YAMA: Princess, I tell you for the last time, you will not! Still, I can only admire your courage and your firmness. I will grant you one last favor—anything but the life of your husband! SAVITRI: Then grant many children to me. And let them be children of Satyavan! NARRATOR: Yama’s eyes grew wide as he stared at Savitri. YAMA: You did not ask for your husband’s life, yet I cannot grant your wish without releasing him. Princess! Your wit is as strong as your will! NARRATOR: Yama took out the spirit of Satyavan and removed the noose. The spirit flew north, quickly vanishing from sight. NARRATOR: The sun was just setting when Savitri made her way back to Satyavan. His chest rose and fell. His eyes opened. SATYAVAN: Is the day already gone? I have slept long. But what is wrong, my love? You smile and cry at the same time! SAVITRI: My love, let us return home. NARRATOR: Yama was true to all he had promised. Savitri’s father became father to many more. Satyavan’s father regained both sight and kingdom. In time, Satyavan became king, and Savitri his queen. They lived long and happily, blessed with many children. So they had no fear or tears when Yama came again to carry them to his kingdom.